With the costs of buying and maintaining a home on the rise, Canadians are increasingly relying on secondary suites to help mitigate the costs of homeownership. According to a new report by Mortgage Professionals Canada, Canadians who purchased their home within the past two years reflect a "new normal" in the Canadian housing market. Thirty-four per cent of first-time buyers think it's important to generate income from their properties, and 13 per cent of homeowners undertook renovations to add space for a rental unit. The report contains data obtained from various sources, including an online survey of 2,000 Canadians. 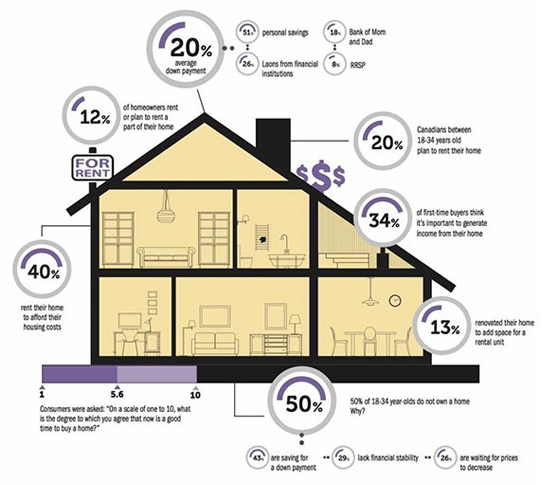 According to the respondents, current homeowners renting a secondary suite indicated that it was a necessity, with 24 per cent stating, "I need to rent a room/unit in my home to afford my mortgage," and 15 per cent acknowledging that they "would have to make major lifestyle changes if [they] did not have rental income." "Creating income remains a useful tool for first-time homebuyers," said Paul Taylor, president of Mortgage Professionals Canada. "People are looking for ways to make owning a home more affordable. Generating income allows them to reduce their mortgage more quickly." Each year more than a third of mortgage holders take actions that will shorten their amortization periods, such as creating and renting a secondary suite. For homes purchased during 2014 to 2016, the average contracted amortization period is 22.4 years. The most recent buyers expect that, on average, they will repay their mortgages in 18.8 years, which is 3.6 years shorter than their average contracted period. There are multiple factors contributing to this "new normal." Of course, rising house prices, especially in hot markets such as the Greater Toronto Area and Greater Vancouver area, has put added pressure on first-time homebuyers to save a larger down payment. Moreover, the new mortgage stress test implemented in October 2016, which is currently 4.64 per cent (and far above the actual interest rates found in the market), means plenty of prospective homeowners will either have to lower their budget, or continue saving. "It is too soon to measure the impacts of this policy change," said Will Dunning, Mortgage Professionals Canada Chief Economist and author of the Annual State of the Residential Mortgage Market in Canada report. "The survey finds that among potential homebuyers who expect to be subject to that test, their ability to buy a home will be impaired. As a result, they also expect that there will be negative impacts in the overall housing market and in the broader economy." Homebuyers are seeking various avenues to achieve their down payment; personal savings is still the primary source of their down payments, but homebuyers are more likely now than ever before to rely on other sources including, loans from financial institutions and withdrawals from RSSPs (including via the Home Buyers' Plan). There is also a larger dependence on the "Bank of Mom and Dad," where new homebuyers receive funds from parents and family members. Many parents have enjoyed rapid increases in their home values in the past decade and a half, affording them the ability to assist their children. Here are the key highlights from the report.